Rounds: Are We Spinning our Wheels? As a Johns Hopkins undergraduate, I used to run the Welch lecture series in medical history. Through this role, I learned about an interesting tidbit – the origin of the word “rounds.” Johns Hopkins Hospital had a circular ward where the infamous and quotable Dr. Osler made his “rounds” to see patients. Communication, which included coordination of patient care team, patient/family communication, establishing rapport with patients and/or family, and establishment of roles. Medical education, including clinical education, exposure to clinical decision making, role modeling, student presentations, establishment of trainee autonomy, and providing a safe learning environment. Assessment, which included both attending observation, assessment, and feedback and establishment of expectations. Patient care, which included both formation of the patient care plan and delivery of patient care. Perhaps the most important question posed in the study was “What do you believe the ideal purpose of rounds should be?” While there was general agreement on medical education, the most interesting finding was that all pediatric attendings emphasized family-centered rounds and patient/family communication while only 23% of internal medicine attendings did. I knew pediatrics emphasized family-centered rounds, but could internal medicine be that far behind? If so, why? I cannot help but wonder what patients would think of this study and in particular what their perspective on rounds are? It also reminds me of a prior study in the Journal of Hospital Medicine that described how Dr. Monash (also co-author on the current rounds study) and colleagues went to great length to make rounds more patient-centered, except the learners did not like them as much. So is there a happy medium? And if so, where and how do we get there? These are just a few of the questions that I had, and I am sure you may have others or want to share your perspective on what the purpose of rounds should be. 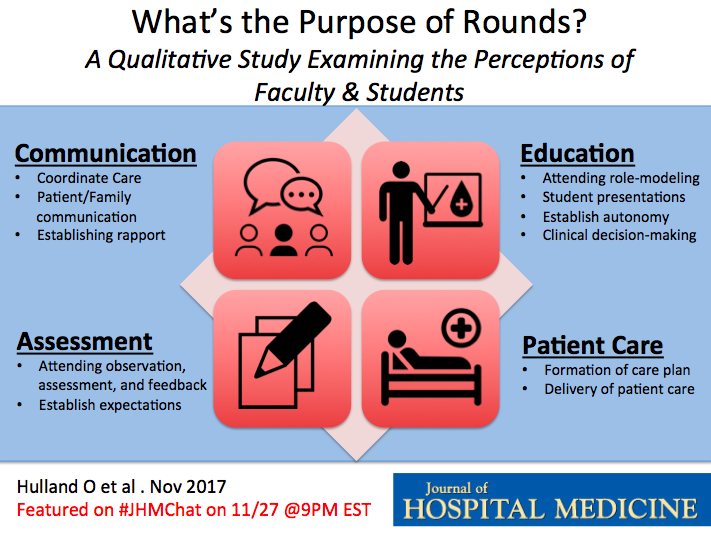 Unlike rounds, which “can be time consuming, complex, and vary in quality” according to the paper, #JHMChat is always one hour, simple to participate in, and very engaging according to this moderator. We welcome you to join us for #JHMChat on Monday, November 27th at 9pm ET. In the interim, have a happy Thanksgiving holiday and for those of you on-service, happy rounding. Speaking at a Conference? Read These Tips First.